President Petro Poroshenko has said that during four years of Russia's war against Ukraine, Ukrainians managed to preserve the state, consolidate the nation, create a strong army and gain international support. He said this in the Independence Day speech, as quoted by his press service. "During four years of the war that Russia has unleashed against Ukraine, we have preserved and strengthened the state. The nation was consolidated on the principles of country protection and patriotism. We have created a strong army with you. And with the painstaking work of our diplomats, we have provided international political and diplomatic support for the independence of Ukraine," Poroshenko said. He said: "The main thing is that we have firmly chosen our path of development. And we do not have the right give it up in favor of external enemies and their agents inside the country". According to him, Ukraine breaks "all the bundles that connect us with the Russian Empire and the Soviet Union". "To make independence irreversible, make Ukraine great and strong, without any prospect of returning to the Russian influence zone - this is the main task of our generation. This is a task of the society and the authorities elected by it,” he stressed. "We, Ukrainians, go our own way and understand that we must first of all rely on our own strengths. Use the wealth of the country in the interests of the people and the generations to come. Ukraine must firmly defend its national interests. External help is still important for us, but first of all we have to help ourselves," Poroshenko also noted. The president said that the strengthening of independence should take place in concrete steps. "The visa-free regime for travel of Ukrainians to the European Union is valid for over a year. We inevitably become part of the European space. It strengthens our political independence," he said. The president recalled that the Association Agreement and the Free Trade Agreement with the European Union entered into force, and as a result, the share of exports to the EU is now almost 43%, compared with 32% four or five years ago. "A clear European strategy has given us an opportunity to compensate for the huge losses that we suffered as a result of the politically motivated closure by Russia of its market and transit to third countries for Ukrainian goods. Russia will no longer be able to blackmail us because we have strengthened our economic independence," he stressed. Poroshenko also said that since the autumn of 2016, we have not bought gas from Russia for 1,000 days already. "Naftogaz Ukrayiny brilliantly beat Gazprom in the Stockholm Arbitration, bringing $4.6 billion to the state pocket. That is how we gain our energy independence," he said. "Last four and a half years have become a truly "great hour" for us, Ukrainians. We have experienced an incredible test of the war and economic crisis caused by Russian aggression. The enemy murdered thousands and thousands of Ukrainians - military and civilians; men, women, children. We were tested both for strength and fortitude. They tried to divide the people and dismember the country. They tried to block our movement to Europe. They wanted to drive the freedom-loving people back into the odious imperial stall," Petro Poroshenko said. The president thanked every Ukrainian for the fact that we withstood: "And we have not only survived the bad times, but also strengthened muscles. We have become stronger and more confident in our own capabilities. We have laid the foundation for our progress with clear strategic reference points for the European Union and NATO for the future decades". 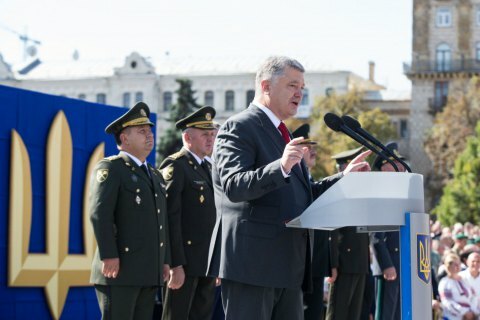 Poroshenko especially emphasized that in 2018 Ukraine would celebrate the centenary of the independence of the Ukrainian People's Republic and the 100th anniversary of the unification of the UNR and ZUNR was approaching. The President noted that Ukrainians had lost the state at that time, had not withstood in that war with Russia. "Our generation faces the task to break the fatal historical circle when Ukraine's independence was measured for months or years. To prevent decades of mourning over the loss of the state and analyzing the reasons of another defeat. To be proud of victories and success of the state," he said.